Non-profit, volunteer organization committed to providing boys and girls ages 7-19 living in Addison County with a positive soccer experience. MWS is hosting a two-hour clinic emphasizing fundamental skills, gameplay, and FUN! When: Session I: April 25th, 2019, Session II: April 26th, 2019. 4:00-6:00 pm. This entry was posted in News Flash on April 8, 2019 by Jenn. Please attend if you are currently a goalie or wish to be in the future! Goalkeeper training (U14-19), Saturday, 3/9 & 3/23 in the VUHS Gym with Coach Roger Miro. These will be the only training sessions for goalkeepers in March. Once we get outside, Roger is willing to work with goalies on Monday’s in Middlebury, times TBD. Please let Kevin Hayes know if you are planning to attend (hayesfamily122@gmail.com). Please also wear full gear, i.e. : gloves, long pants and long shirts (preferably padded). This entry was posted in News Flash on March 4, 2019 by Jenn. 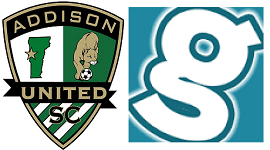 We look forward to the upcoming season and are happy to have you as part of the Addison United Soccer Club family! This entry was posted in News Flash on March 1, 2019 by Jenn. This entry was posted in News Flash on February 28, 2019 by Jenn. 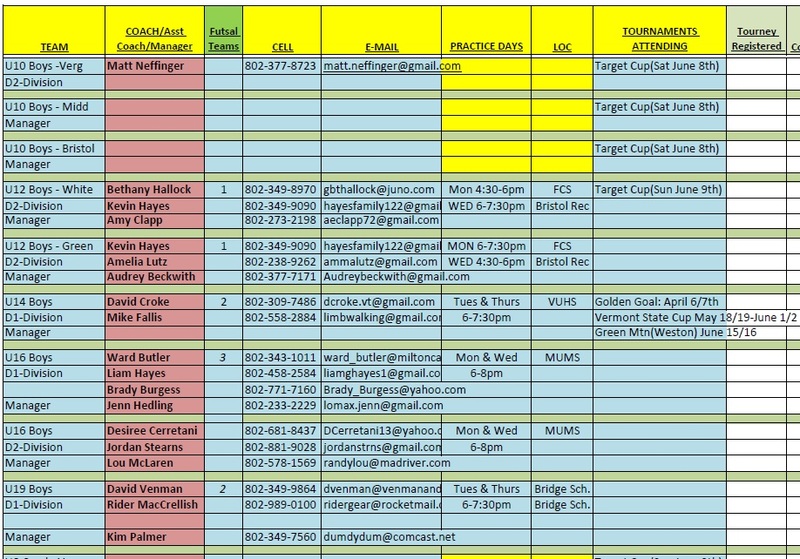 Sunday Practice schedule, March – updated! 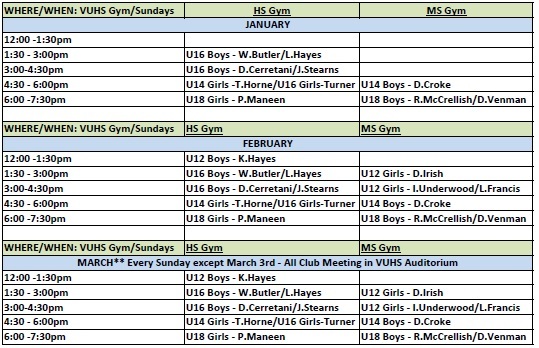 Club 2019 Season Meeting for REQUIRED for all U12-U19 players and parents is Sunday, March 3rd, 3-5 PM, in the VUHS Auditorium. No Sunday practice. Uniforms will be distributed at this time. Practices held at the Vergennes Union High School in the HS and MS gyms. Please enter the school at the main HS gym entrance. All other entrances will be locked for safety. This entry was posted in News Flash on February 26, 2019 by Jenn. *Your coach or manager will let you know when practice will start outside. We will go over the handbook which included team expectations, coach expectations, game and tournament guidelines, practice information and more important information. It also gives you a chance to meet board members, coaching directors and other coaches. We hope that the meeting will take about an hour. And there will be time for questions afterwards. We hope to be able to hand out most of the uniforms but due to some late registrants, not everyone will have them. We will also have some waterbottles and other AU swag for sale. Fundraising of all types helps us provide more scholarships and coaching clinics among other things. This entry was posted in News Flash on February 24, 2019 by Jenn. Just wanted to give you a head’s up on a change to our scheduled Futsal Session III. We include this session for all U12-U19 players as an additional team building, small field & skill experience and fun part of our winter training. Previously scheduled at the Shelburne Fieldhouse, we will now be joining Far Post Soccer Club in their larger scale futsal program. We have one team who has been playing with them since November and have enjoyed the larger team population and competition. Starts March 5 for 7 weeks. Games will be scheduled between 6:30-8:30pm. U12 Boys & Girls Fridays. U14 Boys Monday. U14 Girls Thursdays. U16 Boys Tuesdays. U16 Girls Thursdays. U18 Boys Tuesdays. U18 Girls Thursdays. Coaches will be in touch with more details. We will do our best to form teams (futsal is only 5v5) that are geographically friendly so you can arrange carpooling. Far Post plays their matches at their indoor center which is at the Champlain Valley Expo Center (105 Pearl St, Essex Junction, VT 05452). Helpful hint: It’s actually faster and easier to get on I89 and get off on the St. Michaels exit. Hope winter training has gotten your player excited for the upcoming season. Remember any concerns and issues can be directed to Matt at: communication@addisonunitedvt.com. This entry was posted in News Flash on January 23, 2019 by Jenn. Sunday practice begins Sunday, 1/6 for all U14 – U18 teams. 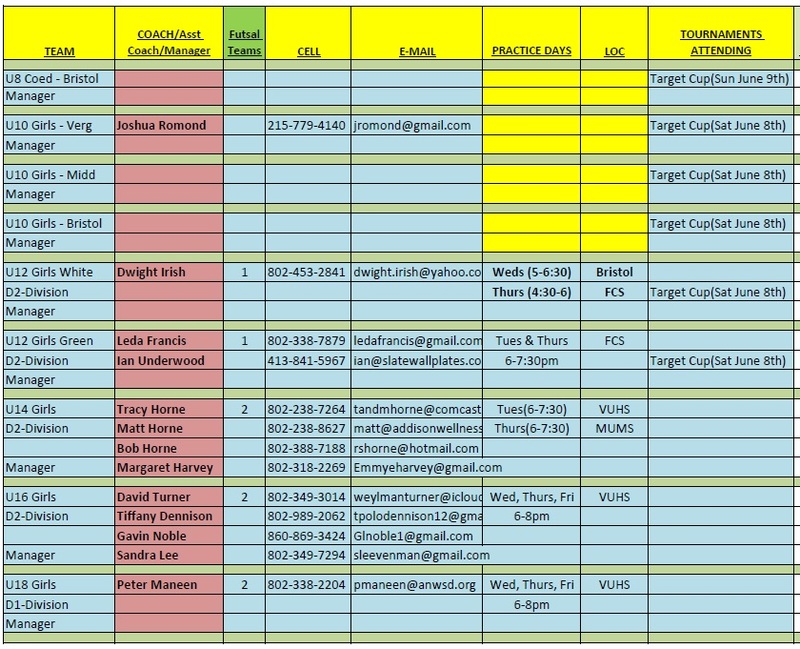 *Practices held at the Vergennes Union High School in the HS and MS gyms. **Please enter the school at the main HS gym entrance. All other entrances will be locked for safety. Please notice the change in times for the U14 Boys and U18 Boys teams. This entry was posted in News Flash on January 6, 2019 by Jenn. Club 2019 Season Meeting for all U12-U19 players and parents is Sunday, March 3rd, 3-5 PM, in the VUHS Auditorium. No Sunday practice. This entry was posted in News Flash on December 20, 2018 by Jenn.